I learned to love hockey not so much by the reflexive property (a = a) but rather, by the transitive property (if a = b and b = c, then a = c). In other words, I love Brian and Teddy; Brian and Teddy love hockey; so therefore, I have come to love hockey, too. Growing up in Canton, I always knew that people in this town thought that hockey was a pretty big deal. Some of my high school friends played and Brianne and I had fun going to games and cheering them on. But we both enjoyed playing our own basketball games way more, and it didn't matter to us that our crowd was one-tenth the size of the crowds at the hockey games (there was only a boy's team at the time). When I met Brian in college, he was trying out for the hockey team. I remember how excited he was when he made it, because unlike most of the players at Bowdoin, Brian hadn't been recruited to play. When we started dating in our sophomore year, I felt obligated to go to the games. Don't get me wrong, the games were really fun -- it's just that I wasn't much fun at all. I usually wished I could watch his games on TV from the comfort of my dorm room (while I studied) but technology then wasn't what it is now. So instead, I joined the rowdy crowd in my own nerdy not rowdy way. Our sophomore year, Brian scored his first goal. 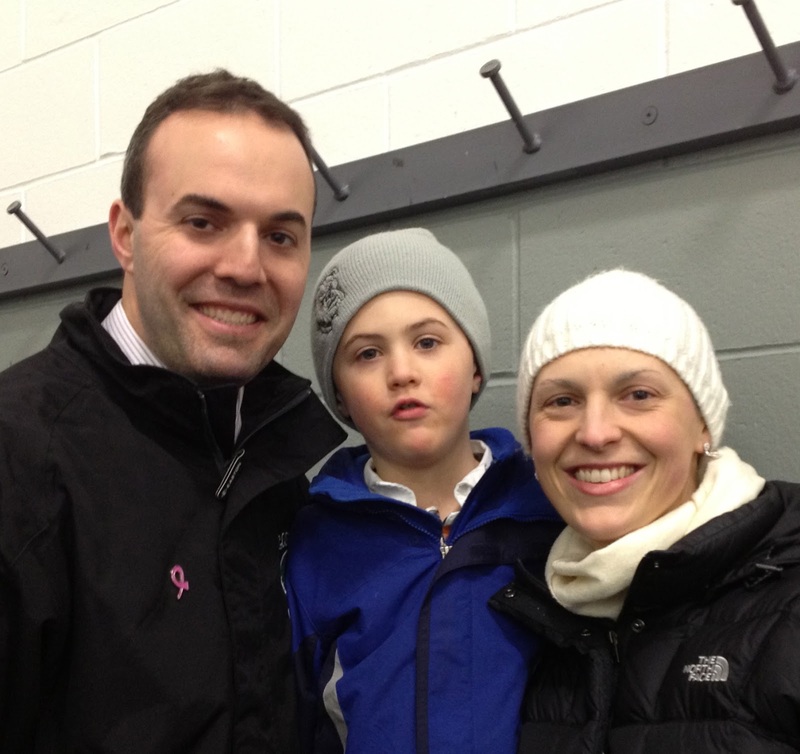 After the game, he asked me if I saw it and I told him that I had -- that it was a really great goal. Later that season I came clean on my terrible lie -- that I hadn't actually gone to the game, and therefore never actually saw the goal; that I used the time to study instead, so that I could have my work done before he freed up. Turns out my little white hockey lies didn't stop there. 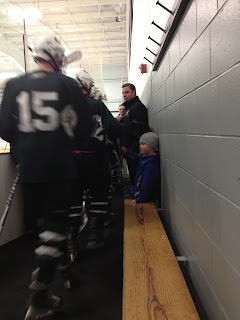 When Teddy asks me after his Mighty Mite "games" if I saw his goal, I always tell him that I did -- that it was a great goal -- even though in reality, I can barely ever even pick him out of the crowd of little kids in the same uniforms. I don't feel too badly about this because I'm sure Brian will use similar little lies if Annabel ever does gymnastics or swims like I did. Did you see me stick my back-walkover on the beam, Daddy? she'll ask him after a gymnastics meet. Brian will reply something like, Yes, I did -- that was a great stick! But in his head, he'll be fishing through old Summer Olympics footage to try to figure out what the "beam" is. Today, Teddy turned five. I thought about him all day; about this milestone for him, and, selfishly, for me. 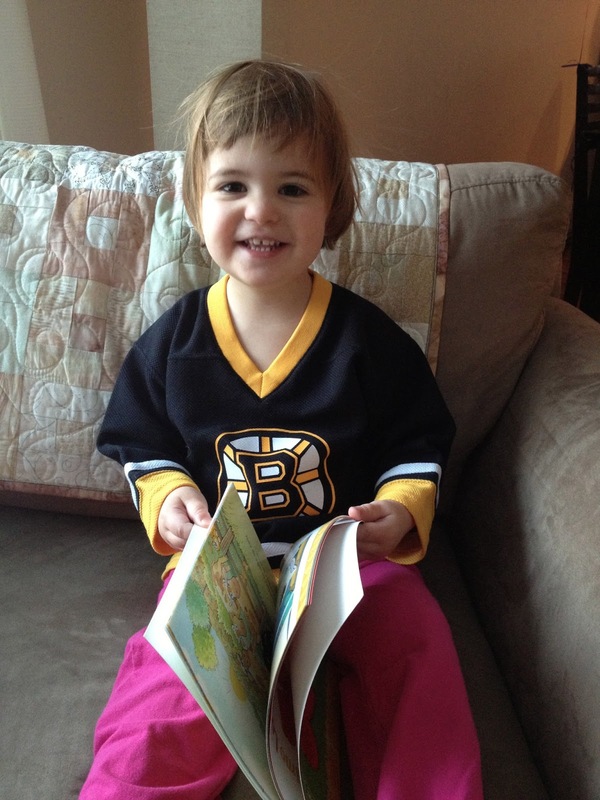 Last weekend, we joined one of our favorite families for a Providence Bruins game. It was Teddy's main birthday gift and he loved it -- that, and a new hockey bag with his name on it. Since the weekend's snowstorm pushed Brian's Saturday night game to tonight, we celebrated Teddy's birthday (again) at home last night for his favorite meal (aside from dinosaur chicken nuggets). Teddy ate four tacos and would have had another one if one was available. Still, I wanted to do something special for him on his real birthday so when Sean agreed to watch Annabel, I decided I could take Teddy to Brian's game. We don't usually go to away games, especially ones during the week, so this was a special treat. Teddy was so excited, and like me, he fought any feeling of tiredness. But truthfully, I think I was way more excited than he was (though probably equally as tired). A whole trip alone with my birthday boy?!? I couldn't wait. We chatted most of the way to the game -- he asked me lots of random things. When we passed the train station he asked me if I was taking the train to work again. I told him I was and I showed him the big pile of snow that the MBTA had assembled in the middle of the parking lot. He asked me when my hair would all be back in. Random question, I thought. Soon, I told him, then I returned a question to his court. Do you like me better with hair or without hair? With hair, he replied. Fair enough. 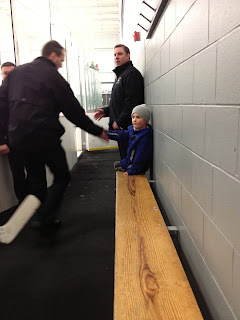 When we got to the rink, he sat beside me. I don't know if it was that he was exhausted or if he has already figured out that I don't have the first clue about hockey, but for whatever reason, he was so quiet during the game. I tried to make some conversation but he just wanted to watch. For three straight periods, we sat beside each other and watched the game. I didn't need to chase Annabel around or make sure that she didn't fall through the bleachers. I didn't need to mingle with anyone, respond to emails, or check Facebook. I just sat next to my little five year old and watched a hockey game. Every now and then, I couldn't resist a bit of communication so I'd ask him which player had which number. In all honesty, I was trying to learn, and since Teddy knows almost every player's number, he was better than a paper roster. If I could really have my way, he would have sat on my lap for the game and let me hug and kiss him. But Teddy is not that type of kid at all. He likes his personal space so I left some between us. Of course, I snuck in a few hugs when I could, which is another reason why I loved when Canton scored a goal -- my son smiled and acknowledged me. While I sat there next to Teddy, I thought again about "stopping." And I realized this -- writing is my stopping. 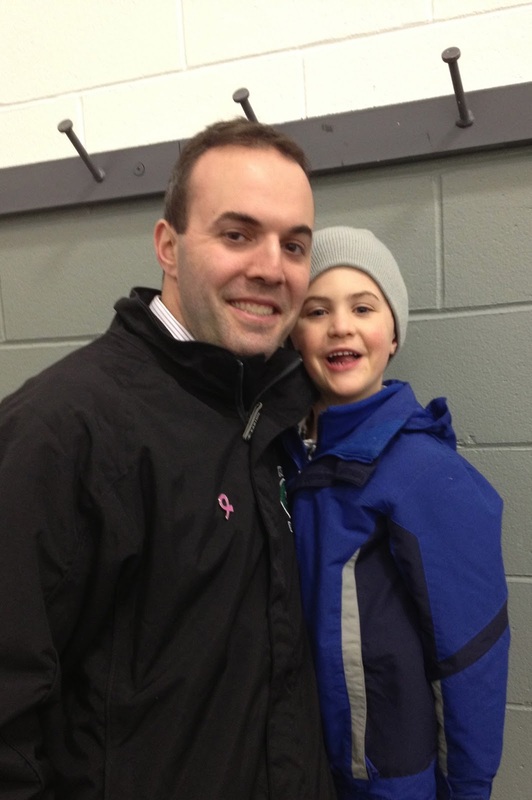 I knew as I sat there that I wanted to write about that game because I want Teddy to know one day what tonight meant to me; how much I loved a few hours alone with him in one of his and his Dad's most favorite places on Earth (a hockey rink). When I start to think about writing, I stop. I see everything, hear everything, smell, and taste, and feel everything. So I did that tonight. I never recommend the smelling part in a hockey rink, and the feeling part can be a bit chilly, but the sights and sounds are awesome. And most of all, sitting in silence next to my little guy was awesome. Obviously I'm no [insert name of hockey sportscaster -- I've got nothin']. But I thought Brian's team looked great tonight and both Teddy and Brian agreed. It was the first full game I've watched in a long time, and it was so much fun. The kids looked fast, smart, stubborn, and scrappy. I like those traits. Most of all though, those high school kids are so darn nice. They treat Teddy like their little brother, and for an oldest child, I know what that means. After every period, Teddy runs over to Brian and gives him a big hug. Then he waits while Brian talks to the team. When they take the ice again, Teddy (and usually the other coaches' kids) lineup to pump fists with the players. Those taps of sweaty gloves against Teddy's little fist mean the world to him, and so, by the transitive property again, they mean the world to me. I may not be able to find the puck on the ice half of the time I'm watching a game, but I sure did enjoy tonight. Teddy can go on thinking that me taking him to the game was a gift from me to him. But really, it was a gift from him to me. "I'll smile for a photo with my Daddy!" Next day addition: As if Annabel knew the hockey fun that she missed last night, this morning she picked out this outfit. Maybe gymnastics or basketball doesn't stand a chance. I love this Tara. We have no hockey players in the family, but an 11-year-old soccer crazed kid (gets that from his Dad) . I especially love the idea of writing as a way of stopping. So very true.